New technologies are changing our reading habits. Laptops, e-readers, tablets and other handheld devices supply new platforms for reading, and we must learn to manage them by scrolling, clicking or tapping. 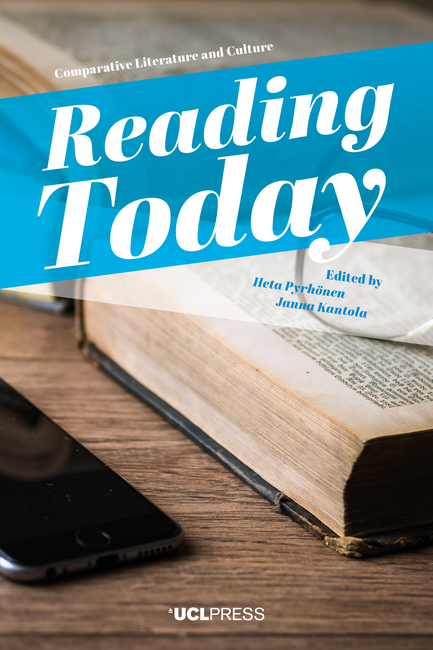 Reading Today places reading in current literary and cultural contexts in order to analyse how these contexts challenge our conceptions of who reads, what reading is, how we read, where we read, and for what purposes – and then responds to the questions this analysis raises. Is our reading experience becoming a ‘flat’ one? And does reading in a media environment favour quick reading? Alongside these questions, the contributors together unpack emerging strategies of reading. They consider, for example, how paying attention to readers’ emotional reactions as an indispensable component of reading affects our conception of the reading process. Readers draw on their emotions in understanding characters, narrated situations, and the significance of events. Furthermore, reading shapes readers’ self-knowledge, enables meaningful experiences of being recognised, and includes them in communities of like-minded people. Heta Pyrhönen is Professor of Comparative Literature at the University of Helsinki. She has published two monographs and numerous articles on detective fiction, a book about the “Bluebeard” tale in British women’s literature, and a book on Jane Austen. Janna Kantola is Lecturer of Comparative Literature at the University of Helsinki. Her specialist area is modern and postmodern poetry, and she has written extensively on Pentti Saarikoski’s poetry. More recently, she has undertaken research on animal studies as well as imagology.